What are the home improvements that will add value to your home in the coming months of 2016? According to recent research by the National Association of Estate Agents, the most profitable improvement is adding a bedroom, usually by converting loft space. Other top value improvements were a new kitchen, creating a conservatory or turning a garage into living space. Of course, for many – maybe for most – people, home improvements are about upping your quality of life in the here and now, rather than increasing monetary value sometime in an unspecified future. This applies particularly to the bathroom, which has become perhaps the most “designed” room in the house – equalling the kitchen in its options, complexity and aspirations. Its facilities are still essential but additionally the bathroom has become a place of relaxation, a sanctuary even, and for those that can afford it, a pool of luxury. Making changes to your bathroom is complicated by your particular type of home with all its variables, including water pressure, waste outlets and so on. You will also need to assess your individual family needs/wishes, your budget restrictions, the vast choice of bathroom fittings, new design and technology and so on. So here is my mantra (as always) right from the start: buy from a specialist dealer, preferably on personal recommendation. Look for a retailer/ showroom who is well-established in your area, and check how long they have been trading, and whether they belong to a respected trade association. See what brands they stock: the big names in bathroom manufacture are choosy about whom they supply. Make sure that a designer will visit your home. A final word of warning: check all suggested plans and specifications carefully, as mistakes are expensive to put right. Bathroom fittings have become infinitely complex, she adds, with, for example, many different designs for baths, basins, wcs, and showers and a huge number of types of tap. There is a bewildering multiplicity of materials, from good old fashioned glazed ceramics and enamelled cast iron or steel, to new moulded resin composites, porcelain and/or ceramic tiles, all kinds of stone and marble, glass, and wood. And how much is a new and/or improved bathroom likely to cost? Bathroom specialists report that on average their clients spend around £10,000. For this, you could buy a freestanding bath, separate shower/wet area/shower enclosure, wc, basin, vanity mirror, tiling, and radiator – but these are only very rough guidelines. C.P. Hart have dramatically enlarged their showroom space adding glamorous roomsettings, an abundance of samples, expert advice/planning/ design, and even a cafe. Find it “underneath the arches” just a few minutes walk from Waterloo station in Newnham Terrace, SE1. Other branches are in Fulham, SW6, and in Wimbledon and Chiswick. And the Guildford branch is in Woodbridge Road. All bathroom specialists warn that installation might add half-as-much again to your costs. For the average bathroom project you would need someone to take out the existing bathroom suite, a carpenter to build walls/box work, a registered plumber and electrician, a plasterer, a tiler and a decorator. Upping the costs might be the building of stud walls, or moving doorways, or replacing a boiler and pipework. You can see how a designer who is also a “project manager” is a boon. Finding the right installers/tradespeople is crucial and you should always “shop around” paying as much care and attention to finding installation experts as you do to sourcing products. Unlike kitchen stores, many bathroom specialists do not offer an installation service as part of an overall package. However they should recommend local experts. Get multiple quotes and ask for testimonials. If possible, ask to see previous work. The trade abounds with horror stories on expensive fittings and/or surfaces ruined by poor fixing – tiles for example. Sophisticated products like spa baths, advanced showers and the new “shower toilets” (also called “washlets” – see below) require technical know-how, and you may find that installation considerably increases the cost. Indeed many functions of these luxury fittings at the top end of the market are no longer essential, but are indulgent add-ons, which use water pressure, heat, lights and scents to deliver a 21st century bath/shower experience. Basins and loos are not as complex, but there is still a huge variety, and there is the added necessity of water-saving. New-tech toilets are streamlined, water-saving and ultra-hygienic. Super-smooth ceramic coatings make them easier to clean. “Rimless” designs have eliminated that water-flushing ledge around the front/sides, substituting a super-charged flush. This gets rid of a germ trap and cuts down hard-to-shift staining from hard water. “Night lights” help you find the loo in the dark. The most advanced loos are “shower toilets.” aka “washlets”. They have a neat little wand at the back which pops out to deliver a “cleansing spray” at your choice of pressure and temperature. 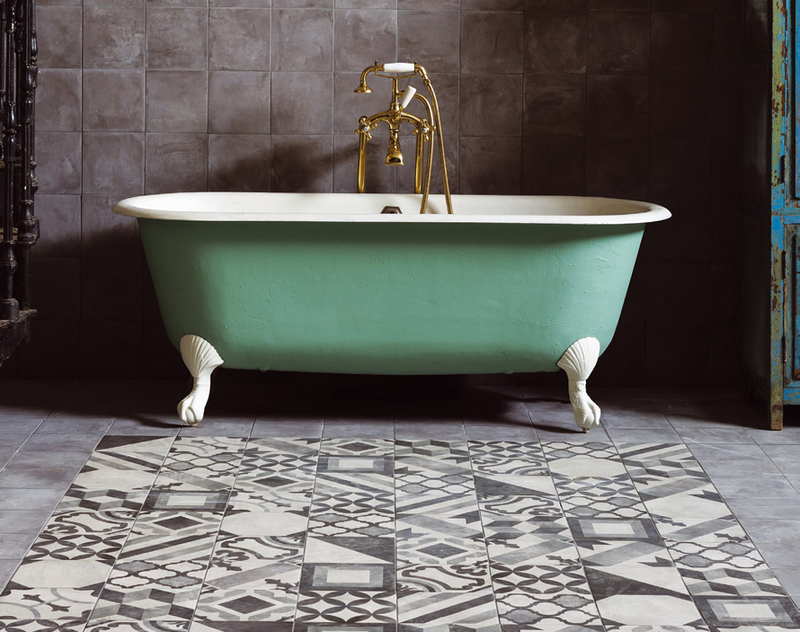 So what are the key trends for bathrooms in the coming year? Experts say that the bathroom has become a decorative space and is being treated the same way as the living room, with rugs, wallpaper, and art, according to the personality of the owner. Once again, expert advice is essential, for in this “complete space” approach, every aspect must be carefully considered from floor to walls to ceiling, plus lighting and heating of course. It’s fashionable to mix brands within the same room – adding a statement basin say, or a particular type of spa bath. Showers, with their elegant and capacious enclosures, now have a life of their own – indeed they have pushed out the bath in some homes. Wet rooms can cannibalise a complete space, so no screens or enclosures are needed at all (but specialist fitting is essential – leaks can cause huge damage to other parts of the home). And the en suite bathroom has become de rigueur – some homes have one for all household members, down to the children and even for the au pair. Technology is inexorably on the rise all around the home and the bathroom is no exception. Find remote-controlled showers and touch-sensitive taps, colourful LEDs, wireless music, luxurious steam rooms, and water-proof remote controlled TVs. Lighting can easily be changed from functional to atmospheric. New digital controls for taps and showers can even be controlled from your phone, with different settings for everyone in the family. “Chromatherapy” offers mood-enhancing colour changes and aromatherapy a chance to choose your own scents. Music with high quality sound is also an option, with Bluetooth speakers concealed in mirrors or even in the bath. We also quizzed Jane Gilchriest, director of Alternative Bathrooms, who have a 2,600 sq ft flagship store in Wandsworth Bridge Road, SW6, with 30 plus room settings, showing everything from simple, no-frills ranges to high-end architectural products. 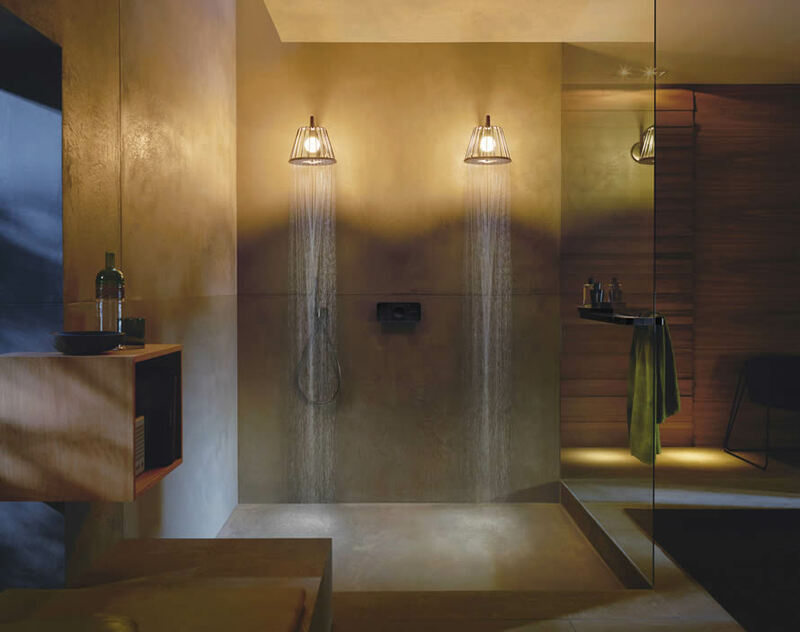 Italian cabinets can be made to measure, and luxurious showers tailored to your wishes. There is a complete planning and design service. Branches are also in North and West London; www.alternativebathrooms.com. Jane highlighted a return to warm metal finishes for taps and showers, including bronze and rose gold. Dan Cook at C.P. Hart mentioned the different plating techniques which can produce pale blondes and warm ambers, or at the other end of the spectrum, dense matt black – leading German brand Hansgrohe (taps and showers) now offer many of their ranges in 15 distinct finishes. It’s white however that understandably most people still want. It has an aura of cleanliness, embodying hygiene. At the same time, white, though eminently affordable, is elegant and gives a feeling of brightness and space. “White is particularly good for small bathrooms where the light is reflected in all directions. The bathroom seems larger, and becomes a space for relaxation and clear thoughts,” says Martin Carroll, director of Duravit UK. With so many sculptural shapes to choose from, together with the design potential of taps, tiling and floor, nobody could say that white was “boring”. To increase that spacious effect, keep the floor area free, by choosing wall-hung sanitaryware, and cupboards. By contrast, a fashionable free-standing bath swallows up space. Here you should check that surrounding floor surfaces are easy to clean. If water is coming in through a tall “standing pipe” make sure that this is robust and sturdy. These baths tend to be on the deep side, so older users may want to check that there are good grips.